I worked a few hours at a time on this streetscape commission over the past week and sprayed it once. It’s not quite finished in the photo because I had to take the picture while the daylight held. Studio lights just don’t make it for photography. 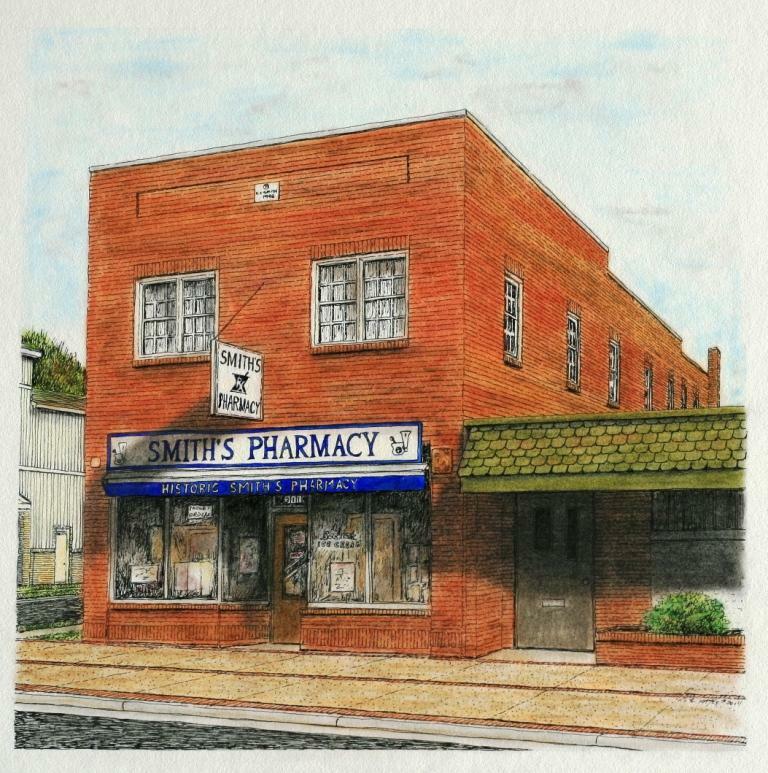 I have darkened up the shadows as well as deepened the colors on the front facade and sidewalk to add depth. I watercolored the blue for the signs because it was too narrow to do neatly with the pastels. I have softened that vivid blue a bit with some cream and beige pastels. All in all it’s shaping up nicely and I will get it in the mail as soon as the weather improves. Next up I will be making a few more of the cookie mold paper ornaments. I sold the angel and the sheep in my etsy store and will be replacing them. I have a few others I can do for Valentine’s Day and Easter so it will be kind of a crafty week. After what felt like too many fits and starts, I finished the inking of this architectural. I don’t know why, but it felt incredibly hard to work clearly on this. Maybe the cold/snow. cold/snow and more cold/snow is finally getting to me. I have been planning tomorrow’s coloring session in my head. The lettering on the big sign across the front is a royal blue on white and I am thinking I may use watercolors for it. It is so narrow that there is no way I will be able to use the pastels and keep it neat. The canopy below is the same blue with white lettering. I will probably use watercolors there also and then go over and soften with the pastels . Maybe it will be finished by Sunday. I tell you, I’m not going anywhere anytime soon. At least the sun was out today. My work table has been seeing quite the swing of subject matter lately. I was almost finished with the 3 dog portrait last week, when I got a medium sized commercial building commission. I started on it but with car battery trouble and the snowy weather, as you can see, I didn’t get very far on it. 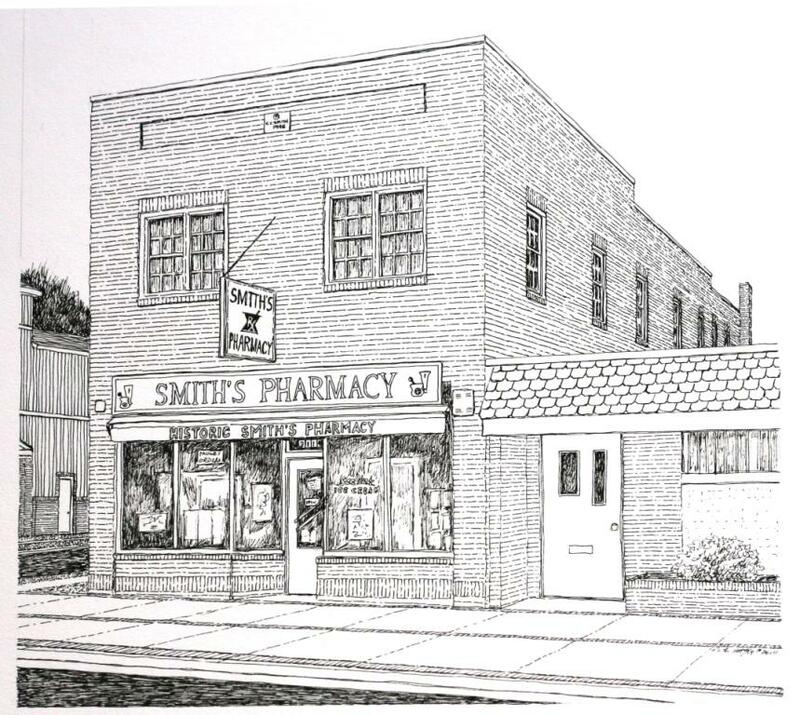 It is an historic building that was the family owned pharmacy built in the 40’s by their grandfather. That was back when a pharmacist actually compounded many prescription himself, unlike today. Sorry about my picture quality, but the pencil and ink combination makes it hard to have it very light. Here we have it. I worked on the watercoloring over three separate days and finally quit. Suddenly I felt I was starting to fiddle around and that never ends well. It was harder than I expected to do the three at once. Do I work mainly on one at a time, or do I work on all of them simultaneously? It ended up being some of both. It got too distracting to move from dog to dog, so I initially worked on one part of one, like the head or the chest, and then move to a different one. At the last, I was trying to finish each one separately so the figure had a coherent flow of color and texture. 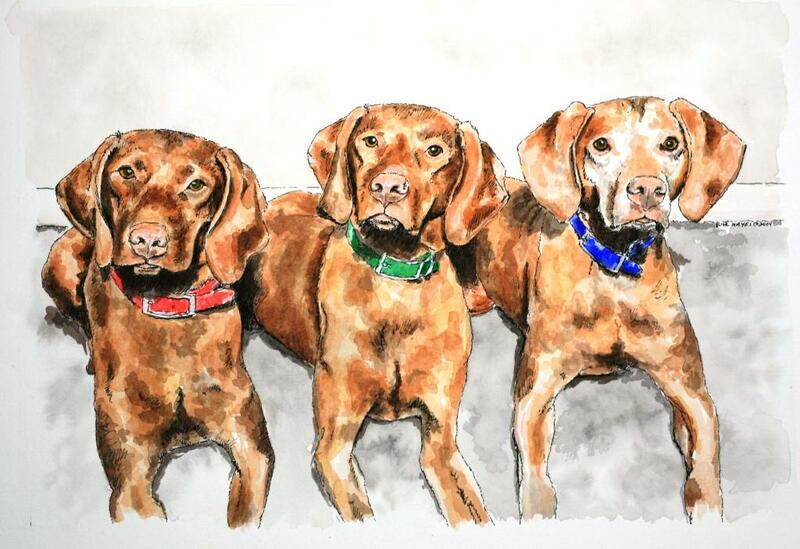 Although all three are red vizslas, there is color and expression variations among them. The guy on the right is the elder statesman. His face was very grayed and he had quite the worried expression. The middle dog was also the mid-range of their colors. He appeared reddish-gold and seemed the most interested in what might be happening. The red of the last one on the left had a more brownish cast and he seemed the most layed back. I feel pretty confident that I kept their expressive faces distinctly different and showed the color variations. Still, three at once was hard to do, if only from the standpoint of size of the picture. What do you think of the three? Did I succeed? So far, this has been fun. The three dogs have quite different faces and expressions and I want to make sure I keep that. The poor guy on the right has a slightly worried look, the middle one seems merely interested in why they have to all lay in this row together and the left guy looks a little bored with the whole thing. These vizslas must be very well behaved to get them to line up and stay with such happy faces. I have erased the grid lines and am currently working on the watercolor. It will be a little bit slow with three to do at once but it is progressing well. I decided to work on them as a whole to keep the colors consistent on each session’s work. This will be a multi-day project and I will use up different amounts of the prepared colors each time. I’m not much good at trying to reproduce a give shade at a later date so this will minimize the problem. The worried one is an older animal so he has lots of gray in his face. The other two have much richer red coats (ah, youth). It will be interesting to work with the colors to make the slight differences apparent. I hope to have it finished over the weekend. 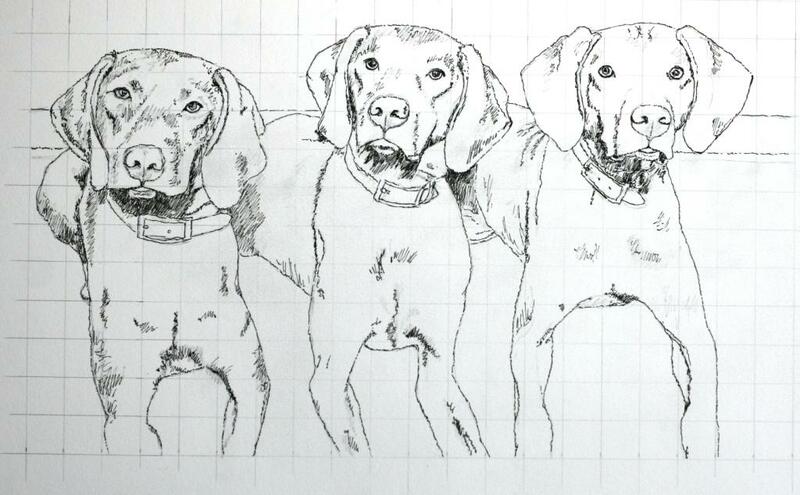 I had a request from a family member to make a portrait of three of her friend’s Vizsla dogs. I happily agreed. I look at it as a chance to do a breed and color of dog that I have never done before, with no real pressure. And like doing the black cats before I had the black dog commission, I see this as a way of practicing a portrait of multiple dogs in one piece before I need to do it. Surely this will come up some time in the future and I’d rather have at least worked out some of the technicalities. Already I found out the I’d better not have a side by side set up. Because of the size of the drawing, it became too difficult to look at the photo and then the sketch when I moved off of the end dog. 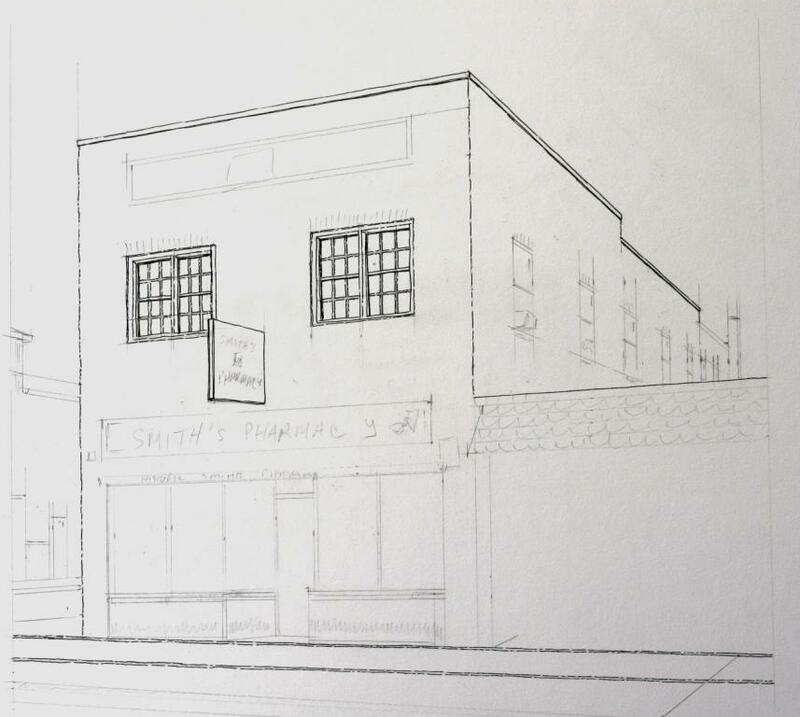 Fortunately, with a little bit of adjustment, the way I had laid the grid over the photo allowed me to move the pair above the sketch without having to realign them. Sometimes dumb luck is good luck. Since the sketch is 15″ x 8″, it still is slightly inconvenient, but I can see what I am doing more readily. In reality each of the dogs is no bigger than one at the regular 5″ x 7″ portrait size. I think I will try to do most of the inking all at one time. It will keep the continuity of the drawing part. I am most concerned with keeping the flow going with the watercolors. There will be a lot of time painting three dogs and I want to be able to have some uniformity of colors and brush stroke. I haven’t decided if I want to work some on all three at once or on mostly one at a time. Fortunately, they are slightly different colors because they are all different ages. I’ll just have to take it as it comes and am looking forward to starting the inking . 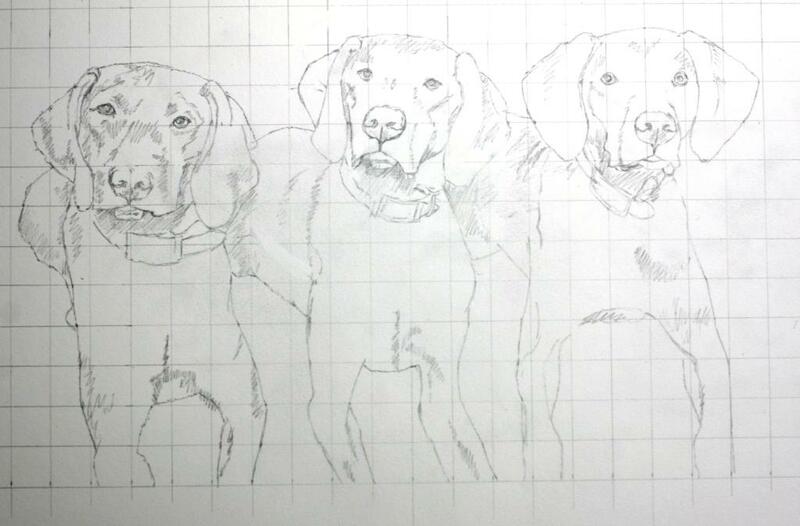 It does need to rest a bit before I restart because there are so many details with three dogs.